The history of deep sea exploration by vessels goes back to about the mid-seventies. 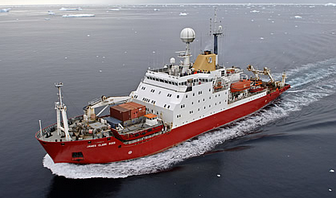 The British RRS John Brisco was extensively re-fitted for study of physical oceanography, in response to the growing demand for deep sea research. It was replaced in 1991 by the vessel pictured here in a NERC photograph - the RSS James Clark Ross. This was the first British Antarctic Survey (BAS) vessel to be purpose-built as a science platform. Projects such as mapping and collecting cores of the sediments around Antarctica, in association with the JOIDES Resolution drill ship, provide information to enable prediction of changes in the ice sheets surrounding Antarctica. Similar investigations of the geological record, on continental margins in the northern hemisphere, have given insight into the controls determining ice sheet retreat. Many commercial vessels are equipped with drill rigs; both in the energy sector, and in geological research. The already mentioned JOIDES Resolution (Joint Oceanographic Institutions for Deep Earth Sampling) is used in the International Ocean Discovery Program and has drilled into many seamounts and ocean trenches - usually bringing up basalt of oceanic crust. Liftboat Myrtle, on expedition 364 of the IODP, brought up limestone, granite and breccia! The continental crust of Chicxulub. The study of geologic events on the sea bed, which range from effusive outpourings of basalt at mid-ocean ridges, through eruptions of seafloor volcanoes, to earthquakes at subduction zones, or slumping of sediments, in turbidite flows down scarp slopes, enable mitigation responses in the event of resultant tsunami, or volcanic fallout or pumice rafting. The use of ROV, remotely operated vehicles, or manned submersibles enables us to understand, from visualisation, how economic mineral deposits are formed. The discovery of hot water circulation through the ocean floor, revealed previously unknown biomes; and also the creation of rich mineral deposits - mostly sulphides (British spell-checker at work! ), and insight into the deposition regimes of some, now terrestrial, ores. 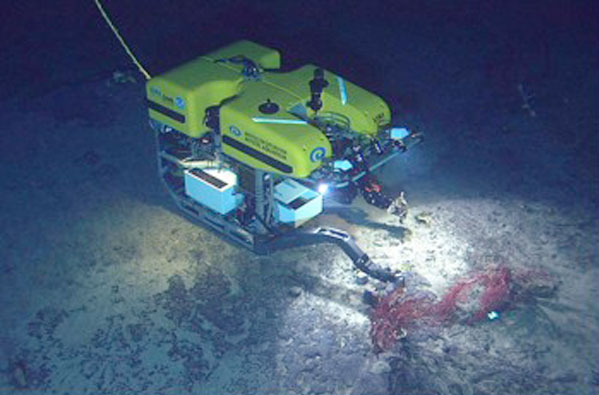 The debate continues on the mining of the ocean floor. Whereas some licences have been granted, opinion is varied on the advisability of taking minerals from the deep. Of concern, to some, is the spectre of pollution that may be caused…. 2018 marked 50 years since the Deep Sea Drilling Project Leg 1 sailed from Orange, Texas to New Jersey, drilling 7 sites in the Gulf of Mexico and the Atlantic Ocean. Thus started more than 50 years of international co-operation in scientific ocean drilling that has brought together scientists from around the world in collaboration and cooperation to better understand our planet Earth. This long-standing effort constitutes a continuous series of individual programmes, and as such is one of the most successful and longest multinational science collaborations. Land-locked Leicester is hardly the most obvious location to develop an interest in ocean drilling. It’s even less obvious as a place to develop an active participation in ocean going scientific expeditions. Yet over several decades University of Leicester scientists have participated in a wide range of drilling expeditions with aims as varied as understanding past climate change to evaluating the deep processes within the Earth and their impact on our environment; from investigating processes and hazards that affect humans, to discovering the extent and diversity of the deep biosphere. Many of these scientists have gone on to work in academia or industry and consequently there is now a large international network of researchers that has resulted from involvement in ocean drilling at Leicester. This short introduction to the day explores the involvement of some of those scientists through a brief history of the University’s involvement with ocean drilling. Leicester scientists have been able to build a successful international presence and establish a highly regarded reputation for the University. Today, global events create an interesting, and at times daunting, environment in which we continue to build international cooperation and explore the oceans. Hopefully, the next 50 years will see the University of Leicester continue to be involved in exploring the Earth through ocean drilling, in collaboration with colleagues from around the world, thus contributing to our increased knowledge and understanding of planet Earth. The European Petrophysics Consortium (EPC) comprises two European universities: University of Leicester (UK) providing the location for its head office; and University of Montpellier (France). The EPC works with other European research entities to undertake ocean-going research expeditions on behalf of the International Ocean Discovery Program (IODP). These expeditions involve commissioning commercial vessels and transforming them into capable research vessels through the addition of labs, offices and sometimes drilling equipment. The EPC has played a central role in 8 expeditions since 2003, drilling into the seafloor beneath ice-covered water, within continental ocean inlets, and through coral reefs. Involvement in these expeditions is primarily through the provision of research staff, but also a containerised petrophysics laboratory. The Earth today has major ice caps on Antarctica and Greenland. But this was not always the case. Before 34 million years ago, the climate was warm - so warm that there was no permanent ice on Antarctica, and palm trees stretched as far north as the Arctic Circle. However, this warm period ended abruptly, around 34 million years ago, when a large ice sheet developed on Antarctica. In this talk I will show how microfossils from deep sea cores, collected through the International Ocean Discovery Program, and its predecessors, can reveal environmental changes that accompanied the greenhouse-icehouse transition. Over the past 40 years our understanding of the diversity of life in the deep sea has been revolutionized by the discovery of dense communities of large animals living at chemosynthetic environments. 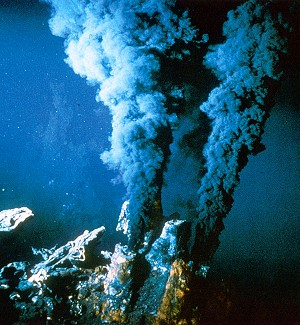 These communities can be found at hydrothermal vents, methane seeps and organic-falls (sunken dead large marine animals and wood) where the energy source at the base of the ecosystem is chemical (chemosynthetic), rather than coming from the sunlight falling on the upper layers of the ocean (photosynthetic). These chemicals are reduced compounds, such as hydrogen sulfide and methane, which is then oxidized by microbial organisms to produce energy (chemosynthesis). Many of the animals that dominate the biomass at modern chemosynthetic environments have symbiotic relationships with these microbes (chemosymbiosis), and this allows these animals to grow very fast and to large sizes, compared to their relatives in other marine environments. These animals include bivalves, gastropods and tube worms. Fossil vent communities are found in two different rock types in the geological record: volcanogenic massive sulfides (VMS), which formed at high temperature vents, and jaspers (iron-silica rocks), which formed at low-temperature, sulfide-poor vents. Animal fossils can be found in VMS deposits from the Silurian period onwards, although there are some enigmatic structures from Cambrian vents, which might have had an animal origin. Microbial fossils have been discovered in VMS deposits all the way back to the Paleo-archaean era (3.235 billion years ago) and in jaspers to the Eo-archaean (3.770, or possibly 4.280 billion years ago), with the latter being the oldest organisms yet discovered on Earth. 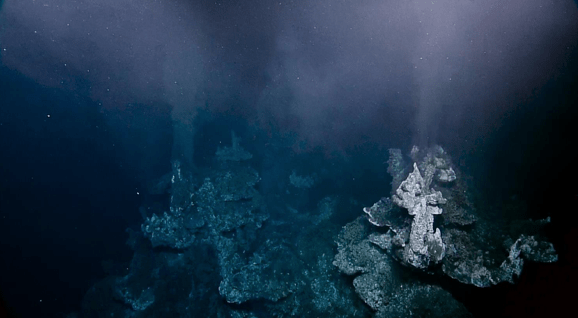 These very early dates help to corroborate ideas that terrestrial life may have started at hydrothermal vents. The evidence also suggests that life may have been possible on Mars during its equivalent aged warmer period, and that life may be present at putative hydrothermal sites on the icy moons with liquid oceans (e.g. Europa and Enceladus). Subduction plate boundary faults are capable of generating some of the largest earthquakes and tsunami on Earth, such as the 2011 Tōhoku, Japan. However, in the last 15 years a new type of seismic phenomena has been discovered at subduction zones: slow slip events (SSEs), where slip occurs too slowly to produce seismic waves. SSEs may have the potential to trigger highly destructive earthquakes and tsunami on faults nearby, but whether this is possible, and why SSEs occur at all, are two of the most important questions in earthquake seismology today. IODP Expeditions 372 and 375 drilled the north Hikurangi subduction zone in New Zealand, where well-characterised SSEs occur every 1-2 years at depths of <2 -15 km below seafloor. The expedition installed two borehole observatories, close to the patch of slow slip, to investigate physical property changes over the slow slip cycle; and collected geophysical log, and core data, to characterize the sediment and rock types involved in slow slip. New seismic images (made using man-made acoustic waves) collected in 2017-2018 will in the future allow us to better understand the slow slip environment, in 3D, below and around the drill sites. In this presentation Rebecca Bell will discuss the objectives and preliminary findings of Expedition 372/375 and the recent seismic experiments, which aim to unlock the secrets of slow slip. The complex geology of the UK Atlantic Margin is ripe for resource exploration and exploitation. Yet despite decades of exploration activity, parts of the margin remain unexplored and critical questions about the timing and mechanisms that drove its geological evolution remain unanswered. The reasons for this uncertainty are many; inclement weather and deep water to the northwest of the UK make exploration costly and difficult, but it is the geology itself that presents the biggest obstacle. The UK Atlantic Margin is blanketed by widespread extrusive Paleogene basaltic facies and intruded by variable and voluminous intrusions; the acoustic impedance contrast generated at the contact between these hard basaltic rocks and the soft Eocene-Recent sediments that lie above them hampers seismic imaging and limits our ability to map the structure below. This talk will: 1) outline the fundamental unanswered questions about the geology of the UK Atlantic Margin, which are critical for both our understanding of passive margin evolution and for resource exploration, particularly in unexplored parts of the Rockall Basin; 2) consider some of the techniques that can used to overcome the challenges of sub-basalt exploration; and 3) show examples of how we are now exploring the sub-terra incognita on our doorstep.